Elk Meadows Elementary was built in 1998. It serves 805 students in grades K – 6. The school is located in the southwest corner of Jordan District’s boundaries and serves the Garden Grove, Vista Farms, Elk Meadows, Whispering Sands, Ashford Acres, Cameron Park, Edenview, and Hearthstone subdivisions. 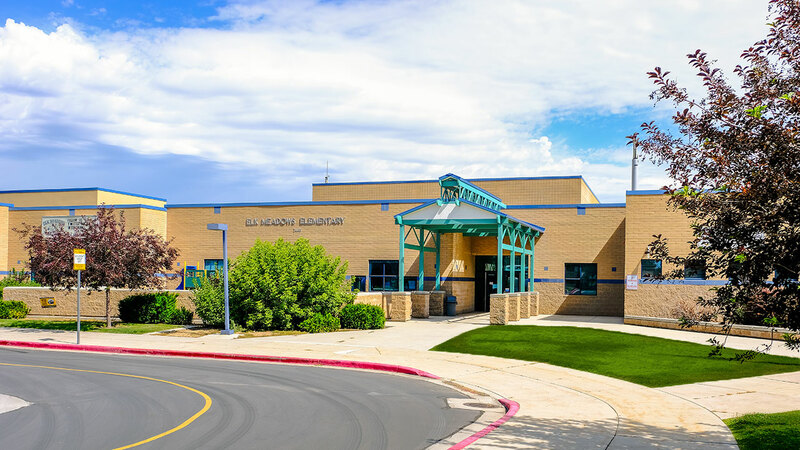 The mission of Elk Meadows Elementary is to create learners and leaders for today and tomorrow as students strive for personal and academic excellence. The staff at Elk Meadows works diligently to create a safe, nurturing learning environment where every student can master basic skills and develop their unique talents and abilities through a variety of learning experiences. A strong, positive school climate is established where teachers and parents work in partnership to ensure students gain academic competence, develop social skills, and become responsible citizens. Students are expected to develop academically and in personal responsibility by being at school and being on time, working to the best of their ability, obeying school rules, and showing courtesy and respect to all teachers and peers. Students are expected to learn self-discipline. If serious problems arise, the student, teacher, parents, counselor and principal work as a team to find the best solution for the student. The teacher/student ratio is 1 to 26 in first grade, 1 to 24 in second grade, 1 to 22 in third grade, 1 to 27 in forth grade, 1 to 26 in fifth grade, and 1 to 23 in sixth grade; however, individual class sizes vary. Additionally, Elk meadows houses two specialized support units and one diagnostic kindergarten unit. The faculty has a wide range of backgrounds and talents and is comprised of experienced teachers. Many have advanced degrees and educational endorsements beyond the required teaching certificate. They provide a welcoming environment and strong academic program for our students. The established school curriculum meets or exceeds all State and District standards. Teachers collaborate in teams and plan together to ensure that classwork in each grade level is aligned with the State and District Core Curriculum Guidelines and students are provided with a maximum of learning opportunities. Elk Meadows has conducted significant in-service programs with the staff to strengthen literacy and math skills for all students. The school has been awarded grants of up to $10,000 to concentrate on reading, science, physical education, and environmental studies. Teachers are evaluated regularly with the aim of maintaining high quality instruction in every classroom. The research based programs My Sidewalks and Success Makers are used to provide targeted support for students in the areas of reading fluency and comprehension. Certified resource teachers, a speech pathologist, and guidance counselor are available to offer a variety of services to our students with special learning needs. Technology education plays an active role in our students’ learning. The desktop computer lab has the latest flat screen technology, and several mobile laptop computer labs have been added to serve children in all grades. All computer labs function to provide our students experience with keyboarding and word processing skills, opportunities for individual and project-based activities in technology, and supportive software in language arts, math, and science. Elk Meadows is proud to be a training site for student teachers from many local universities. We welcome these teachers and look forward to working with them each year. The Leader In Me program is thoroughly implemented within the instructional curriculum and is designed to assist all students in building leadership and positive character traits. Monthly assemblies are held to recognize our students’ efforts and growth in these areas. Our Student Council representatives gain valuable leadership and communication skills as they model appropriate school standards, work to build school pride, and serve others. A before-school choir program is in place and is offered to all interested students, and a before-school orchestra program is available to students in grades 3 – 6. Nutritious, well-balanced breakfasts and lunches are served daily. Elk Meadows supports the District dress code, which requires clean, neat, modest clothing with no depictions of violence or tobacco/drug/alcohol products. We are fortunate to have an outstanding community base and an active PTA that helps our students succeed in school. Parents are supportive and involved in their children’s education, and members of the PTA spend countless volunteer hours to help provide enrichment activities for students. The School Community Council (comprised of neighborhood representatives, teachers, and the principal) assists with planning school-wide projects and regularly gives vital input on important school issues. Visitors are always welcome at Elk Meadows and are asked to check-in at the office upon arrival. The Elk Meadows staff is always happy to assist visitors and anxious to help new students feel at home.